Get Vendio Gallery – Now FREE! SALES & TECH SUPPORT. Official Distributor of VViViD VINYLS 3M and HEXIS. Please review the following illustrations for different applications that you can accomplish with our Carbon Fiber texture. Hover mouse over thumbnails for larger photo. Different colors are available. Is proud to bring you a product of unparalleled quality and value from VViViD vinyls. VViViD vinyls are cast films manufactured in Germany and distributed all over the world, their standard Carbon Fiber vinyls offer premium 3D stamping to give you the textured characteristics of carbon fiber. These materials will stretch and conform to any shape. Every material VViViD Vinyl offers is either a CAST or PRO CALENDARED material. Cast vinyl is stable when applied to a surface. It harbours no tension, whereas calendared vinyl harbours up to 25%. Calendared vinyl is made by processing a mass of vinyl through rollers and stretching it over hundreds of feet. Therefore when applied to a curved surface such as a car, calendared vinyl will shrink back causing curling and other issues. In contrast, VViViDs cast vinyl starts off as a liquid and is poured onto a sheet and baked. This means the cast was never stretched to begin with and will stay in place for the life of the vinyl. When cast vinyl is accidentally creased or stretched, you can heat it and it will return to its original form without creases or stretch marks. Pro-calendared offers the same advantage. It has been heated/treated and pre-stretched allowing for a cast-like application. The glue includes standard air-release creases for seamless, bubble-free installation. The glue also offers a technology called Heat Fuse, adding an extra dimension of stability to the vinyl once applied to your surface. Heat Fuse Technology allows you heat the edges and the air release tunnels cave in and create a vacuum beneath the vinyl creating a suction cup effect. Long life span, up to 10 years indoor and 4-6 years outdoor. UV and water resistance. Cast or Pro-Calendared material. Stretch retention of less than 1% (compared to cheaper vinyls with 25%). Conformability and stretch up to 200% (30% or less is suggested for optimal performance). We do not accept partial payments. We have warehouses in MONTREAL, BOSTON and ASIA. These are claims you must file yourselves. How much vinyl does it take to wrap a car? For a sedan, about 50 feet with little to no mistakes. A larger car will obviously take a little more. What application method do we use on this film? This film should be used with the dry application method after the surface has been cleaned and no oils, grease, wax, or other contaminants are on the target surface. You may also use the wet application method but it is not recommended. Do you offer custom colors not available on your store? We carry 920 colors and textures for different applications. We have locations in Canada, U. A and the orient. How long will this vinyl last? Most vinyls will not last 3 years outdoors, it may not even last one winter. Our vinyls will last 4 to 9 years outdoors and up to 12 years indoors. Is it hard to get bubbles out of the vinyl? It is extremely easy, the air channels will allow you to push the bubbles with relative ease as to not scratch or damage the surface like other vinyls. Do the vinyls conform or stretch with heat? ALL of our vinyls will stretch, mold and conform when heat is applied. This includes all of our chromes, gloss, matte, and textured films. I heard air channels are bad because the pattern on the adhesive shows through the film. These air channels are designed in a “natural” pattern not a square pattern. So it does not show. ALSO the adhesive compound will fuse when you apply heat and pressure. These films will give you a seamless texture all around. Do you also have installers? We can refer you to these installers upon request. WrapCut Precision Cutting Tape Also Available! 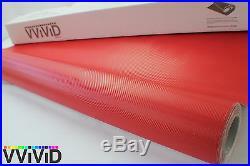 The item “Red Carbon Fiber Vinyl Wrap Sheet Roll 5ftx34ft Bubble Free Technology RCF5M01″ is in sale since Saturday, December 5, 2015. This item is in the category “eBay Motors\Parts & Accessories\Car & Truck Parts\Decals/Emblems/License Frames\Decals & Stickers\Graphics Decals”. The seller is “sticky-graphics” and is located in Champlain, New York. This item can be shipped worldwide. Get Vendio Gallery – Now FREE! SALES & TECH SUPPORT. Official Distributor of VViViD VINYLS 3M and HEXIS. Please review the following illustrations for different applications that you can accomplish with our Carbon Fiber texture. Hover mouse over thumbnails for larger photo. Different colors are available. Is proud to bring you a product of unparalleled quality and value from VViViD vinyls. VViViD vinyls are cast films manufactured in Germany and distributed all over the world, their standard Carbon Fiber vinyls offer premium 3D stamping to give you the textured characteristics of carbon fiber. These materials will stretch and conform to any shape. Every material VViViD Vinyl offers is either a CAST or PRO CALENDARED material. Cast vinyl is stable when applied to a surface. It harbours no tension, whereas calendared vinyl harbours up to 25%. Calendared vinyl is made by processing a mass of vinyl through rollers and stretching it over hundreds of feet. Therefore when applied to a curved surface such as a car, calendared vinyl will shrink back causing curling and other issues. In contrast, VViViDs cast vinyl starts off as a liquid and is poured onto a sheet and baked. This means the cast was never stretched to begin with and will stay in place for the life of the vinyl. When cast vinyl is accidentally creased or stretched, you can heat it and it will return to its original form without creases or stretch marks. Pro-calendared offers the same advantage. It has been heated/treated and pre-stretched allowing for a cast-like application. The glue includes standard air-release creases for seamless, bubble-free installation. The glue also offers a technology called Heat Fuse, adding an extra dimension of stability to the vinyl once applied to your surface. Heat Fuse Technology allows you heat the edges and the air release tunnels cave in and create a vacuum beneath the vinyl creating a suction cup effect. Long life span, up to 10 years indoor and 4-6 years outdoor. UV and water resistance. Cast or Pro-Calendared material. Stretch retention of less than 1% (compared to cheaper vinyls with 25%). Conformability and stretch up to 200% (30% or less is suggested for optimal performance). We do not accept partial payments. We have warehouses in MONTREAL, BOSTON and ASIA. These are claims you must file yourselves. How much vinyl does it take to wrap a car? For a sedan, about 50 feet with little to no mistakes. A larger car will obviously take a little more. What application method do we use on this film? This film should be used with the dry application method after the surface has been cleaned and no oils, grease, wax, or other contaminants are on the target surface. You may also use the wet application method but it is not recommended. Do you offer custom colors not available on your store? We carry 920 colors and textures for different applications. We have locations in Canada, U. A and the orient. How long will this vinyl last? Most vinyls will not last 3 years outdoors, it may not even last one winter. Our vinyls will last 4 to 9 years outdoors and up to 12 years indoors. Is it hard to get bubbles out of the vinyl? It is extremely easy, the air channels will allow you to push the bubbles with relative ease as to not scratch or damage the surface like other vinyls. Do the vinyls conform or stretch with heat? ALL of our vinyls will stretch, mold and conform when heat is applied. This includes all of our chromes, gloss, matte, and textured films. I heard air channels are bad because the pattern on the adhesive shows through the film. These air channels are designed in a “natural” pattern not a square pattern. So it does not show. ALSO the adhesive compound will fuse when you apply heat and pressure. These films will give you a seamless texture all around. Do you also have installers? We can refer you to these installers upon request. WrapCut Precision Cutting Tape Also Available! 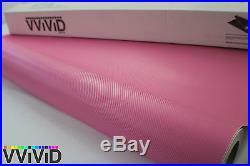 The item “Pink Carbon Fiber Vinyl Wrap Sheet Roll 5ftx34ft Bubble Free Technology PCF5M” is in sale since Saturday, December 5, 2015. This item is in the category “eBay Motors\Parts & Accessories\Car & Truck Parts\Decals/Emblems/License Frames\Decals & Stickers\Graphics Decals”. The seller is “sticky-graphics” and is located in Champlain, New York. This item can be shipped worldwide.